Like a credit card, but better. CareCredit works just like a regular credit card, but without high interest rates, annual fees or pre-payment penalties. 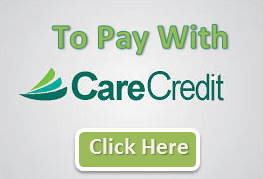 CareCredit offers flexible and convenient financing options with zero hidden fees and low monthly payments. You can use your CareCredit card over and over for all your pet's follow-up care as well as annual exams and vaccines. So you can focus on what really matters, like playing fetch and learning new tricks. Click below to apply for a new CareCredit account or use your existing CareCredit account to make a payment.